To service the emerging need to collect high-quality vibration data for extended periods under increasingly stringent subsea environments, Stress Engineering Services has developed a state-of-the-art Subsea Vibration Data Logger (SVDL). Vibration in deepwater applications most often occurs in the form of wave-induced motions, vessel induced motions, vortex induced vibration, or flow induced vibration. 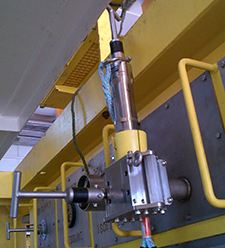 The SVDL installs directly on subsea equipment in order to monitor these and other forms of vibration and to assess fatigue. Designed with a long battery life, low power consumption, and large memory storage, the SVDL operates in two states: long-term intermittent or short term continuous. In long-term intermittent monitoring applications, the SVDL allows users to observe structural changes, like damage or wear, over a period of months. Short term continuous monitoring is for characterizing equipment changes over a specific time window lasting up to 3 weeks. Housed inside the unit is a high-quality tri-axial accelerometer. The accelerometer is constructed using a state-of-the-art MEMS process to achieve unprecedented sensitivity and resolution. Signals are passed through an aggressive low-pass analog filter prior to being digitized by a high-resolution analog-to-digital converter. In addition to signal filtering, oversampling techniques are employed to maintain the highest digitized signal quality. The data logger and custom-designed clamping devices feature a low mass and high mechanical impedance structure. This ensures that the vibration signals collected by the logger are not distorted by the mechanical characteristics of the logger system itself, even at high measurement frequencies of 50 Hz or greater. The SVDL has a depth rating of 10,000 feet in seawater. 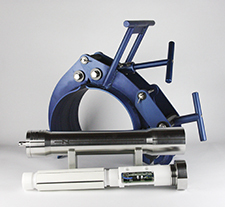 Its sensors and electronics are fully enclosed in a one-atmosphere aluminum subsea housing with redundant o-ring seals at each closure. All exposed aluminum surfaces are hard anodized, and the device is ported for nitrogen back-fill. This back-fill prevents the formation of moisture, which could potentially damage the internal electronics, within the device. In addition, there is a pressure relief valve to prevent over-pressurization in the unit, which could occur due to thermal effects imparted during pre-deployment operations.